A good pair of binoculars is a must-have for outdoor activities like camping, hiking, and even stargazing. But finding the most suitable pair at the right price can be challenging. There are many brand names for binoculars in the market and there’s no one-size-fits-all model. The best binoculars would depend on your individual requirements and budget. Want to find out how to find a pair of binoculars you won’t regret purchasing later? Then read ahead for our thorough reviews of the best products available in the market right now. 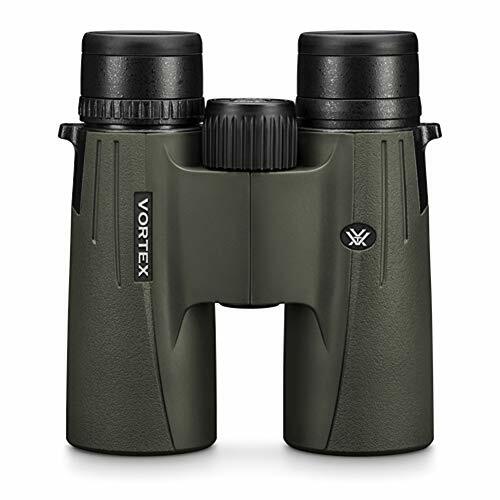 The Vortex Optics Viper binoculars come with two sets of lenses: 10×50 and 10×42. The 10×50 will give you better light transmission and more field of view. The 10×42 pair is slightly cheaper. The best parts of this pair are the lenses. The optical system is enhanced with high-density lenses covered with an anti-reflective coating. Clearer and crisper images. The anti-reflective coating makes it easy to see even on foggy days. The roof of this prism binocular pair is coated to improve resolution. We did manage to see more color-accurate images through these. The pair comes encased in a sturdy, rubber chassis with Armortek coating. The binoculars are fully argon-sealed for waterproof and fog-proof features. The eyecups can be adjusted to different positions for easy viewing. The binoculars have a right eye diopter to change the focal difference between the eyes. Not only is this comfortable, it also allows use without glasses. However, lack of eye relief makes using this pair of binoculars rather difficult for those who need prescription eyeglasses. Changing the position of the eyecups is also a bit difficult. The mechanism can feel stiff and tight. 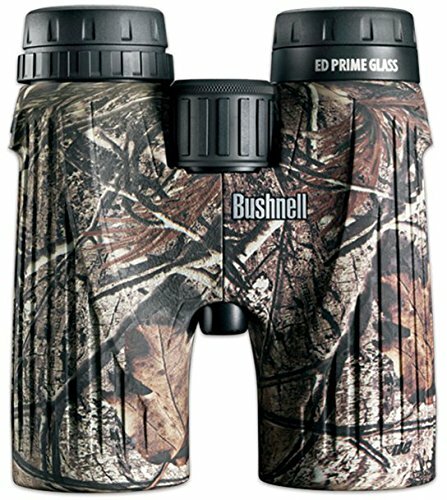 This Bushnell has 10x magnification and 42mm objective lens. This much-hyped pair is often considered one of the best binoculars recreational users can buy. Long eye-relief, ultra wide field-of-view, and a locking diopter. This binocular pair comes with twist-up eyecups that allow two different eye-relief positions. The result is more comfort, even for users wearing eyeglasses. The field of view is really exceptional, especially when paired with the coated lenses (more on that below). Like with the Vanguard mentioned above, there’s a high level of image clarity and crispness. The diopter ring can be adjusted to an exact setting that’s easy to remember for using later. It’s a great feature, except that the ring is hard plastic and can be difficult to adjust. The fluorite glass lenses with anti-reflective and Rainguard HD coating. The low-dispersion fluorite glass eliminates color aberrations. The patented anti-reflective coating allows maximum light to enter the lens, resulting in high-res images. The Rainguard coating makes the lens water-repellent. The lens will not be affected by moisture or condensation problems caused by rain, snow, or sleet. 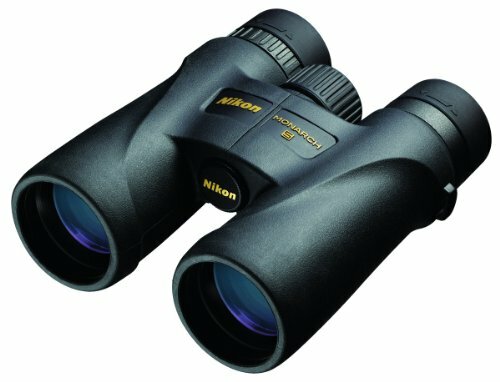 Nikon has always been a solid brand for a pair of binoculars. And the 7576 really ups the game in terms of lens features. 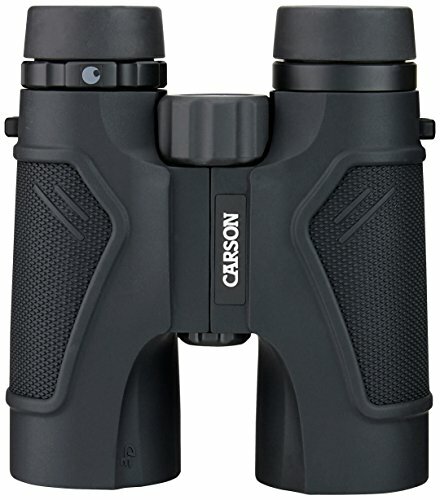 This pair of binoculars is equipped with extra-low dispersion glass lenses. This feature can correct chromatic aberrations and color fringing. Superior quality images at high resolution. The images won’t lose or gain contrast in a manner that distorts the image. The lenses are fully multicoated. It has a form of patented anti-reflective coating that minimized the loss of light so the view is clearer. The other coating is a highly-reflective prism coating that enhances color accuracy. You can see colors in the same brightness as you would naturally see them without the binoculars. The binoculars are sealed to make them waterproof and fog-proof. The body of the binoculars is rubber armored for easy handling and durability. The body has a non-slip grip. Thanks to the high-eyepoint design in the body, the viewing comfort is one of the best in the market. We found this pair of binoculars to be very portable as well. Despite the high-end construction, Nikon really manages to keep the weight off. We found the 8x magnification to be quite disappointing. The field of view is also only 228 feet, when it really should closer to 1,000 feet given the price tag. Ignore the 3D moniker that makes these binoculars sound like a toy. These actually come with extra-low dispersion lenses that deliver brighter and sharper images. It has 10x magnification with 42mm objective lenses. The field of view of 314 feet at 1,000 yards is pretty solid. The 16mm eye relief. It’s impressively long for use with eyeglasses. This pair weighs only about a pound so it’s very easy to carry. The package also comes with a bunch of accessories including lens cloth, covers, and a carry case. The BAK-4 prisms. These prisms can phase-correct to improve color fidelity, resolution, and contrast. The prisms are dielectrically coated for better light transmission. This makes up for the lack of anti-reflective coating on the lenses. You can expect well-detailed imagery with this feature. Plus, the pair is waterproof and fog-proof as well. Ergonomic thumb grooves that make holding this pair for a long time really comfortable. These binoculars are tripod-mountable too. They come in BioArmor casing that keeps them safe in rugged environments. What we weren’t so crazy about was the lack of eyecup adjustment. The lens covers can easily fall off too. The Upland Optics HD binoculars are made for hunters. But birdwatchers and campers can certainly benefit as well. It has a standard 10x optical zoom with a 42mm objective lens. The pair weights about 1.4 lbs, so it’s moderately weighty. The package comes with plenty of accessories including a carrying case, lens cloth, lens caps, and a neck strap. The extra stuff is well-worth the overall price. The 17.2mm eye relief. It’s significantly wide enough to be used by people with eyeglasses. The field of view, disappointingly, was only about 124 feet per 1,000 yards. It could definitely be better considering the price tag. The pair came in a waterproof body. The binoculars were encased in a rugged shell that can withstand harsh environments. The lens glass is extra-low dispersion. This ensures that the image clarity is high with minimal to no color aberration. The lenses are fully broadband multicoated too. This means the lenses and the prisms are layered in 5.7 coatings, usually green. We found this pair to be quite well-made with great features. It will deliver sharp images with high levels of clarity and precision. The most common type of binoculars available for recreational users. 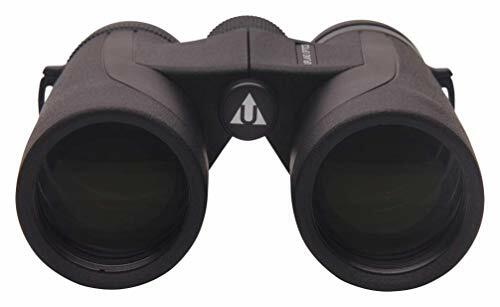 These binoculars can be used for a variety of things such as bird watching and hunting. Binoculars with sealed lenses. The lenses are water-repellant and don’t fog up because of condensation. Types of binoculars that allow users to increase or decrease magnification from close to distant. Binoculars that come with a rubber casing for handling in rugged environments. The casing protects the binoculars from dust, scratches, and other issues. Binoculars that make it easy to track movement far ahead of the viewer, such as at a sports stadium. While binoculars technically have different categorizations, these largely blur in modern products. For example, nearly all high-end binoculars these days are waterproof, armored, and have zoom features. The products listed above are as such. Therefore, it’s best to judge binoculars by these features, rather than try to shop by category. The only exception is if you are looking for compact binoculars. Then you can start your search by narrowing down the sizes. This indicates how far out you can magnify an image. Most standard binoculars have 10x magnification. Each “x” indicates ten times magnification. So a 10x pair of binoculars can make an object located 1,000 feet away appear as if it’s located only 100 feet away. A good pair of binoculars is considered to have a magnification strength between 7x and 12x. More than 12x means the binoculars are too heavy to carry around for recreational use. The objective lens is the glass located opposite the eyepiece you peer into. The size of the lens determines how much light can enter the prisms inside. The more light the binoculars receive, the better the images would be. The size of the objective lens is quite important in low light conditions. You can usually find the diameter of the objective lens listed next to the magnification strength. The lens size is always given in mm. The 10×42 is the most common specification. It’s best if the magnification strength and the size of the objective lens can be divided in 5. Such as 8×45 or 8×40. The binoculars can create a better image with more detail with a larger object lens diameter. This refers to how far out you can see with the magnification level. This number is indicated as x feet or meters per 1,000 feet, yards, or meters. This refers to the distance between the eyepiece and the eye of the user. You need a comfortable level of eye relief if you are using the binoculars with eyeglasses. Too much eye relief can reduce the field of view of the binoculars. The lens coating comes in multiple formats. It’s important for several reasons. The coating mainly reduces the amount of light reflected by the objective lens. This allows more light to enter for a better image. The coating also reduces image aberration and enhances contrast. Some lens coating types can do color correction as well. In low light conditions, lens coating can help you see better through the eyepieces. Applied to the lenses, this reduces how much light is reflected back by the lenses. The anti-reflective coating you find in binoculars is similar to what you find on eyeglasses. Lenses are coated with a single layer of magnesium fluoride. Prisms are not coated. About 5 to 7 layers of magnesium fluoride coating on lenses. A single layer of coating on the prisms. Broadband coating (5 to 7 layers of magnesium fluoride) on all lenses but not on the prisms. Broadband, 5 to 7 layers of coatings, on lenses and prisms. Coated lenses must have a high eyepoint to use with eyeglasses. Waterproofing is not just a feature that protects the interior of the binoculars from rain or liquid splashes. Waterproofing binoculars are sealed. No moisture can get inside and fog up the lenses so the prisms hinder the view. Manufacturers seal lenses using argon or nitrogen. This technique doesn’t make a significant difference, however. It’s highly recommended to purchase a pair of binoculars that are waterproof in some way. It’s worthwhile to pay attention to the weight of the binoculars especially if you plan to carry it around by hand. Pay attention to the clarity, crispness, and sharpness of images. You can understand these by looking at the type of coatings on the binoculars. Check if the binoculars have adjustable eyecups. This would make using a pair for a prolonged period more comfortable. Generally be aware of binoculars that claim to be made in the USA. Nearly every pair is now manufactured in China (including every product reviewed above), even if the company is based in the USA. Buyers will have to judge quality by the brand. Look for a warranty, especially a lifetime warranty. All the products reviewed above have lifetime warranties from the manufacturer. Start shopping with a budget in mind. Binocular prices can greatly vary depending on the features on offer. You might want to keep certain ergonomic features in mind. These design choices make binoculars easy and comfortable to use. You can find a solid pair of binoculars if you are willing to spend more than $50. Once you have set a budget, it would be easier to pick the pair you like the best. When shopping, it’s very important to understand the specs that matter, such as magnification and lens coating features. Don’t waste money on a pair of binoculars that aren’t waterproof. Read the above reviews to familiarize yourself with the best products available. Then you will be able to buy yourself a great pair of binoculars that perfectly suit your budget and needs.